As the signature “Do It Yourself” Team N3kk1d fundraising event, ROCK MS is an evening of raffle prizes, activities, and music performed by YOU. Participants battle it out on the video game “Rock Band” in the ultimate karaoke experience. Winners walk home with the coveted “bag of swag” and bragging rights; meanwhile, all proceeds from the event benefit the National Multiple Sclerosis Society. 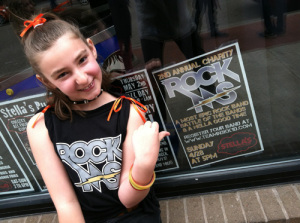 2014’s ROCK MS took to the streets – literally – as a neighborhood block party, raising more than $500 for MS-related research and programs. Hats off to all of our many performers, sponsors, and supporters who have made this event a success year after year! In 2017, ROCK MS made a cameo appearance as a part of the Wisconsin Challenge Walk MS tenth anniversary. The event occurred on Friday, September 22nd at the Green Lake Conference Center and featured trivia, prizes, and more than 400 playable tracks from the Rock Band song collection.